The muses in my head have gracefully given me some background for another story, though I don’t think it is enough for a whole novel. That’s OK, I don’t finish novels anyway. Actually I probably won’t finish this either, but I still find it interesting. It is a mix of fantasy and some allegory, though I think it is pretty subtle. Then again there are people who think C S Lewis is subtle. As usual I make worldbuilding notes in my journal. In this story, there is an old forgotten stone circle, broken and overgrown, that is actually a portal to another world. But it only opens at special times and to people with a special mindset – those who feel they have nothing left to lose in this world except life itself. Or that is what the Keepers say. We don’t know for sure. We know that the main character is pretty close to that, though, after an unlikely string of misfortunes. He feels drawn to the place and falls asleep among the weathered and broken stones, only to wake up to find them in much better shape. He is now in another world, although it takes him some hours to realize it. It is a world similar to ours, but its magic is stronger and slightly different. It is nothing like the magic of Harry Potter or Dungeons & Dragons though. (Or Daggerfall, for that matter.) Rather, it is very similar to the magic of our Earth, a magic of the earth and the sun and the human heart. You may not think of it as magic, because you are so used to it and have read long explanations of it in your school textbooks, but think of it. You dig a hole in the ground and plant a small seed. You water it if it gets too dry, and a plant comes up. You may have to remove competing weeds, and add more water if it does not rain, but eventually the plant bears fruit. It may be a herb or a vegetable or a berry bush or even a tree that gives lots of fruit for decades to come. Or it may be a flower of great beauty. In either case, the most skilled men and women of the world would have been unable to make something as wonderful as this, and yet it grows like magic from the earth and the water, the sun and the air, and a little help from human hands. The human mind is a bit like a dog. The dog will compulsively seek out new places and pee on them to mark them as its own, and then it is satisfied. The human mind likewise will put words on all new things it has found, and then it is satisfied that it owns them. We have done this with the magic of our own world, which we call “life”. It would not take long to extend this a little if we came to a world where there were also the occasional living stone. In the land of the Keepers, there are stones that grow. These are the building material for the Keeps, the castles of magic stone that the Keepers live in. The Keeps have many beneficial effects, like improving the health and lifespan of those who live in them, and improve the fertility of the land around them. Â But they must be built from these special stones that are alive with magic. You have to learn to look for the living stones, for there are many stones in the world and only a few of them are alive with magic. Â They don’t shine with magic, at least not when you are new to them. Â In time they will stand out at a glance, but at first you have to learn about them from books or have people point them out to you or even give them to you. Existing keeps drop some small stones randomly, or you can find them by combing the countryside for them. The stones must not be cut, you have to find other stones that they fit together with. Â Depending on the kind of stones you find, your first little keep – no larger than a small play hut – will have its own unique shape. Â Because the stones are so rare, it will take years to make something you can curl up in on a rainy day. But once they get together with enough other stones, and given time, they will begin to grow. Where they only fit roughly together, they will fill in the gaps until you cannot get a paper in between them. Â And the whole place will expand, so slowly that you cannot see it from day to day or even from week to week, but look back a year or two and it has definitely grown bigger. A fully mature keep has great magic powers. Â Its inside will even amplify light, so that a single candle can make a room brightly lit. Â It makes crops grow faster and bigger around it. Inside it heals wounds and illnesses, makes you stronger and wiser, and extends life with decades or even centuries. Â A keep has a special affinity with its builder, though it will also extend great benefits to his family and even some to visitors. Â A Keeper – the builder of a keep – will not exactly die from old age even after centuries. Rather, he just fades away. Sustained by the magic of the keep he no longer needs to eat or sleep, and eventually he becomes less substantial. He finds that the keep becomes in a way transparent to him: Â He can see anything that happens within it no matter where he is, and eventually he can move from any place to another in it by merely willing it. Â But to the others, it will seem that he is gradually becoming transparent, appearing at will as an image or even just as a voice. Â But this only takes place once Â a keep is several centuries old, and the keep may live for millennia after that. At this time the appearance of the Builder is forgotten, his soul infused in the stones, so it appears as if the Keep itself is a sentient being of great intellect. This entry was posted in writing and tagged worldbuilding by itlandm. Bookmark the permalink. I was reading the Golden One fanfic you wrote, last night. Good stuff. 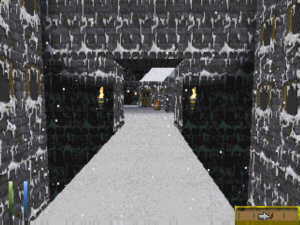 You should put a link to the Daggerfall crossroads on Chaosnode.net. Lets hope the new new Elder scrolls game is like Daggerfall. There is a new Elder Scrolls game? I thought Oblivion was meant to be the grand finale. How do i set up a blog like the one you have? This blog is based on the WordPress software, which is free. I have my own domain, but you can also have the blog hosted on WordPress for free. (I use the domain for various other things as well, not to mention my old website.) I also recommend Blogger, a competing blog software, which has the benefit of being backed by Google. It is also slightly easier to get started with. I use Blogger for some small niche blogs.